Transforming 12 years of genealogy research into a biographical history book that appeals to most any reader who enjoys a good tale, indeed, has been one of the most formidable challenges of my life. Physically, I’ve never climbed Mt. Everest, though the prospect of doing so often has fascinated me since I was a teen. I preferred writing to mountain climbing. Having now climbed the Mt. Everest of turning a massive genealogy database of close to 300,000 related people into an epic view of one family and their panoramic history, and the reflection of their discovery of self in that view, has left me standing on the mountaintop, definitely feeling the chill of the thrill. When I was the author standing alone on the mountaintop, though, I was challenged with bringing that thrill back to earth in an intimate and engaging story for the average reader. This was the most formidable challenge in writing Jesse James Soul Liberty. Eastman’s Genealogy Newsletter is a primary meeting ground for genealogists and family historians at all levels of experience. From how-to and tech tips to the latest news in archival development and events, Eastman’s covers the full spectrum of genealogical interest. In recent months, the book reviews of Bobbi King have been added as a regular feature. Bobbi King has reviewed a couple of family history books on Eastman’s before mine. Mostly they appear as personal memoirs, more than an objective history book. So I was very pleased when Bobbi accepted the challenge to review mine. 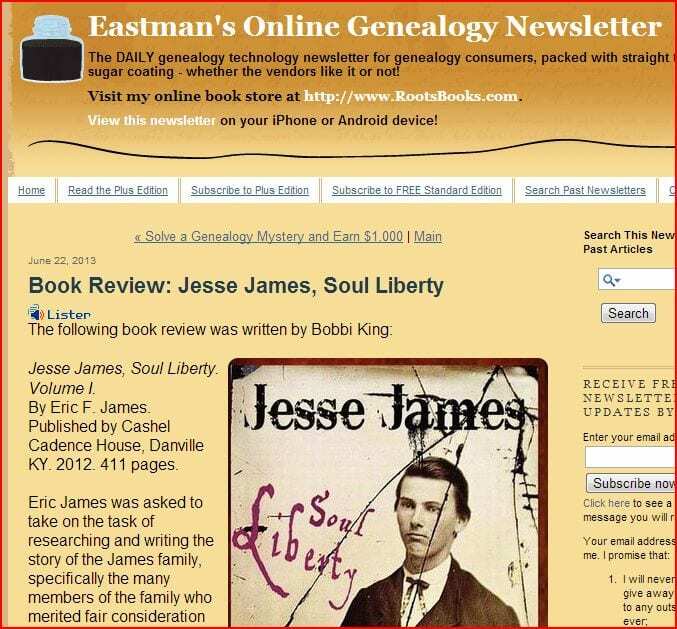 In her book review of Jesse James Soul Liberty, Bobbi King gently reminds genealogists that a good family history book should be interesting to an audience beyond a book’s own subject family. As I was inadvertently climbing my Mt. Everest, every step that lead to each successive discovery or view made me wonder, how can someone else see what I do and enjoy the experience of it. The view from the top of the James family’s precipice is spectacular, and each step leading to that view is an insightful reminder of what it takes to make a magnificent mountain. Magnificent mountains always have interesting stories to tell.